“For those who do not understand ‘one thought is three thousand realms', the Buddha gives rise to Great Compassion, wrapping this jewel within the Five Characters, and has [him]* hang it around the necks of the young children of the Latter Age.” (Kanjin honzon sho, STN, v. 1, 720). At least SGI guidance [brainwashing] is free. 3072 Rock the Era performers East Zone x $125 performance fee; plus $15 for day spectators not including bus fees x ~ 3000 attendees; plus $3 lunch for spectators; plus $125 fee for Temple University shared four? (two?) to a dorm room and 6 meals for 2 Nights stay x ~ 1000. Nearly half a million dollars in profit for the weekend from just the East Zone. At least SGI guidance [brainwashing] is free. I am sorry about your misfortune [of being an SGI leader]. I am not sorry about SGI's misfortune. Nichiren says, "misfortune comes from one's mouth and ruins one while fortune comes from one's mind to make one respectworthy." Your mind has become warped by the SGI teachings that throws out the Lotus Sutra, Shakyamuni Buddha and the entirety of the Bodhisattvas of the Earth for the sake of what, the three mentors and the corrupt SGI organization? It is ironic that you cite "cause and effect". I have a suggestion. The next time you go to FNCC, write down your question about the SGI faith and practice, the Lotus Sutra, and the writings of Nichiren Daishonin. By the time you finish writing down your questions, you might have more than a thousand questions. Certainly, you will have many dozens of questions. Then, seek out the answers from your leaders as if your life depended on it [which it does]. See how many of those questions are answered. Check them off. Write down the answers next to the questions. See how many questions are answered to your satisfaction and let us know. "Answer: The Treatise on the Treasure Vehicle of Buddhahood written by Bodhisattva Sāramati and translated by Ratnamati states: “There are those who deliberately practice a lesser doctrine and slander the true doctrine and its teachers. . . . They preach without understanding the teachings of the Thus Come One, going against the sutras and yet declaring that they are expounding the true doctrine.” If we go by this passage, we must say that those who believe in the Hinayana teachings and declare them to be the true doctrine, failing to understand theMahayana teachings, are slandering the Law. The Treatise on the Buddha Nature written by BodhisattvaVasubandhu and translated by the Tripitaka Master Paramārtha states: “To hate and reject the Mahayana teachings will make one an icchantika, or person of incorrigible disbelief, because in doing so one causes living beings to cast aside these teachings.” If we go by this passage, we must say that in an age when both Hinayana and Mahayana teachings are propagated, if one concentrates on spreading the Hinayana teachings, personally turns against the Mahayana teachings, and causes others toreject them as well, then such a person is guilty of slandering the Law. The meaning of this passage is as follows. Even if one has not yet reached the three stages of worthiness of the Hinayana teaching, or has not yet reached the ten stages of faith of the Mahayana teaching; even if one is an ordinary mortal of this latter age who commits the ten evil actsor the five cardinal sins, who is unfilial toward one’s father and mother, or who is a woman; if such a person hears the name of the Lotus Sutra, or chants the daimoku, or accepts and upholds one word, one line of afour-line verse, or four lines, one chapter, one volume, or all eight volumes of the sutra, reads and recites them, or merely responds with joy and praises a person who carries out these practices, then that person is superior to a great bodhisattva who profoundly adheres to all the sacred teachings of the Buddha’s lifetime other than that set forth in the Lotus Sutra, who has fully mastered the principles of those teachings, and who rigorously obeys all the precepts and rules of the Mahayana andHinayana teachings, and that person will be capable of gaining rebirth in a pure land and becoming a Buddha. But if one fails to believe this when one hears it preached, and on the contrary asserts that the Lotus Sutra was preached for the sake of bodhisattvas who have already reached the ten stages of development and the ten stages of security or have advanced beyond them; or that it was preached for ordinary mortals of superior capacity and superior wisdom, but not for the sake of foolish persons, evil persons, women, or ordinary mortals of this latter age, then that person will destroy the seeds for the attainment of Buddhahood by all living beings and will enter the Avīchi hell. This is what the passage is saying. The Nirvana Sutra states: “When it comes to the correct teaching of the Buddha, they show no inclination to protect, treasure, and establish it over the ages.” This passage means that, at a time when the great teaching set forth in the Great Nirvana Sutra is about to perish from the world, those who do not treasure it are in fact slanderers of the Law. A passage from Repaying Debts of Gratitude in its modern context. *A passage from Repaying Debts of Gratitude in its modern context. not a finger pointing at the moon. In response to Dirham. Sorry. Soka Gakkai steals and usurps the Daimoku of the Lotus Sutra to destroy the Secret Law of the Object of Worship, the concept of Eternal Buddha, the doctrine of the exclusive faith and practice of the Lotus Sutra, the doctrine of the transmission, and the meaning and significance of attaining Buddhahood in this very body. They utilize the writings in a selective and arbitrary manner and highlight the disputed texts such as the forged and insignificant Ongi Kuden to supplement and bolster the erroneous teachings of Human Revolution, Lotus Sutra interfaith, SGI Oneness of Mentor and Disciple, and seeking guidance [control]. They [Daisaku Ikeda and his high paid lieutenants] also steal and usurp Namu Myoho renge kyo to enrich themselves. The key here, I think, is "according to one's strength". It doesn't read, "according to the strength of another". SGI changes Nichiren's teachings for their self serving ends. They are not "Nichiren Buddhists", least of all "The One True Nichiren Sect". Shameful. SGI is a bizarre parody of Buddhism. Nichiren mentions Shakyamuni Buddha thousands of times and with great reverence and deference. The emperor Ikeda has no clothes. He and his disciples are so jealous of Shakyamuni Buddha that they threw him out of his own religion. Years ago, on the Alternate Religion of Nichiren Google group, when former members would assert the centrality of Ikeda to SGI, SGI members would retort, "Shakyamuni the Easter Bunny" or "Shakyamuni Buddha... do you mean Santa Claus?" Isn't it strange that Shakyamuni Buddha, not only is rarely mentioned [in a so-called Nichiren sect] but they defame him. Nichiren mentions Shakyamuni Buddha thousands of times and with great reverence and deference. Were people to follow the Law rather than the person [of Ikeda], there would be no SGI. They fear Shakyamuni Buddha and the Lotus Sutra because belief in them [rather than Ikeda and the SGI] will put them out of a job. World peace and "human revolution" through banal activities? They are confused about the teachings of the Lotus Sutra. Taking SGI's teachings to their logical conclusion, I can see why SGI leaders are so paranoid. They are wary of their own members and their non-Buddhist guidance system lacks privacy. With everyone spying and telling on each other, it is not unlike the practice of the Nazi youth corps. For example, "John Public has been teaching that one doesn't require Sensei for their mentor." or "Debbie Smith has a Shakyamuni Buddha statue on her altar." or "Timmy Lacosta has exchanged his Nichikan Gohonzon for a Nichiren Gohonzon but he is still leading Gongyo as the Chapter Chief." What a way to live! What a way to practice "Buddhism." Avici Hell is populated by SGI leaders and members and by Nichiren Shoshu priests and believers. Hitler, for example, was a master at giving the people what they wanted and then leaving them prostrate on the ground. He gave them the Autobahn, parades, camaraderie, hope for the future, and then hell. There are eight Great Hells in Buddhism. The worst is the Avici Hell, reserved for those who slander the Law. The SGI cult manufactures its history to suit its own narrative. It should be noted that it's narrative has changed several times and so have they changed its history, The truth is always being spun in the SGI cult. They fail to believe in the Lotus Sutra which teaches the principle of thusness [or suchness]. It is useless to rely on the teachings of such people for benefit, let alone for Supreme and Perfect Enlightenment. I can't believe SGI calls what they do "shakubuku"
What they do is actually a type of MLM whose product is "peace", [Japanese] "CULTure", and "education" in order to enrich Ikeda and his top leaders. They are as phony as a counterfeit North Korean hundred dollar bills. But their clam brain non-salaried and low paid gaijin senior leaders are too dumb or brainwashed to see things as they really are. Easy or difficult to leave the Soka Gakkai? If one is "happy' in the Soka Gakkai, it can be extremely difficult to leave despite the inconsistancies of their doctrines and their failure to act as they speak. Who cares if Nichiren and the Lotus Sutra teach that Shakyamuni is the Original Eternal Buddha, there is no proof that Nichiren inscribed the DaiGohonzon, that there is no place for interfaith practice, or the fact that a living master in the seat of Law is not a cardinal doctrine, let alone THE cardinal doctrine of the Lotus Sutra? "I'm happy." It may take a great faith in the teachings in the face of the winds of pleasure, prosperity, praise, and honor to leave the SGI. "The priest known as the Great Teacher Kōbō, however, a man of great falsehoods who was given to praising himself and defaming others, after the demise of the Great Teacher Dengyō, without ever confronting his opponents in debate, succeeded in deceiving the members of the imperial court and was thus able to establish the True Word teachings as the eighth school." 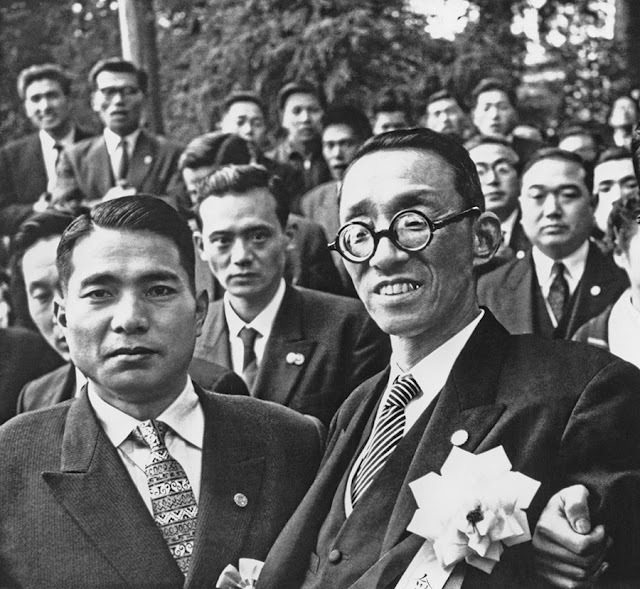 The layman known as the Great Teacher Ikeda, however, a man of great falsehoods was given to praising himself and defaming others, after the demise of the Great Teacher Nichiren, without ever confronting his opponents in debate, succeeded in deceiving the members of the Japanese cabinet and was thus able to establish the Soka school as the most powerful school in Japan." Bottom line, he leaves the disgusting SGI for the bizarre Nichiren Shoshu. You can't get much more stupid than that. and on June 1st, thanks to the Gohonzon, I quit cigarettes for good. Cold turkey and not one cigarette since May 31st. Now when I tell my patients to stop smoking, no one can accuse me of being a hypocrite. Where goes your SGI donation money? "To speak slanderously of the sutras preached in the past, the present, and the future, and to praise one sutra, the Lotus, is the golden instruction of Shakyamuni Buddha, and is what all the other Buddhas have expressed in agreement." Prime Minister Renzi's support of Soka Gakkai assures disaster at the polls. How is it that you made the prediction for the South Carolina "once in a millenium" disaster? The truth is always being spun in the SGI cult. "Therefore, this one Buddha [Shakyamuni] is none other than all Buddhas, and all Buddhas are thus brought together within the two characters of myōhō." One moment of exceptionally profound faith and joy in Namu Myoho renge kyo and its continuous recollection is itself Buddhahood.